8.08 points at 13 votes (rank 69). 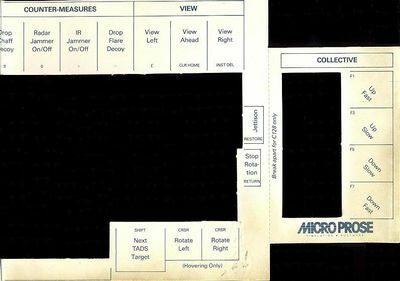 is a military flight simulator by MicroProse. Arnold Hendrick and Andy Hollis created the programme that was released for the Commodore 64 in 1986 and ported to several other systems. As officer cadet and pilot of an AH-64 Apache combat helicopter of the US Army the player can here prove his aeronautical abilities and get awarded several medals for bravery and successful missions. 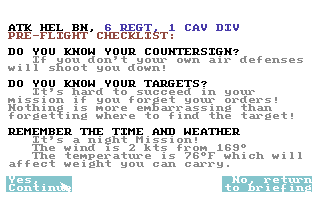 The game offers four different mission scenarios with rising difficulty grade and a training mission for practicing. Furthermore, a great number of paramaters can be set, to adjust the realism of the flight and the vigour of the hostile troops to the player's grade of experience and by this to raise the chance for a promotion. 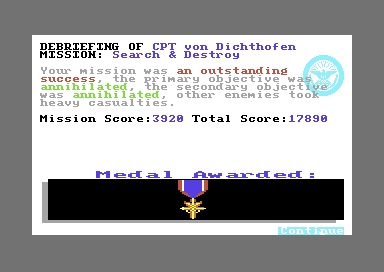 Each mission comprises a briefing and then a final evaluation of the own performance, whereupon the player gets the possibility to save his progress on a disk. The game does not have a proper ending. You are promoted until you have the rank of Colonel. Then you still can collect many medals and awards. The Air Medal, the Silver Star and finally even the "Medal of Honor" are awarded to the player after some successful missions. Furthermore, if you survive three missions in the same conflict area you get a corresponding medal ribbon to be ironed on the uniform. The highest honour that you can reach is, to be appointed Brigadier General. 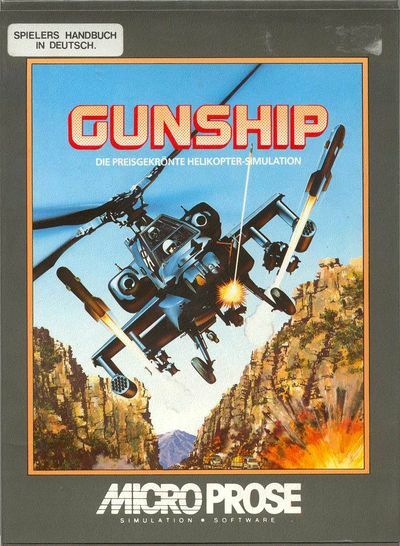 Gunship is a detailled simulation of a military helicopter. In the year of release, 1986, there were until now only a few comparibly complex computer game simulations. 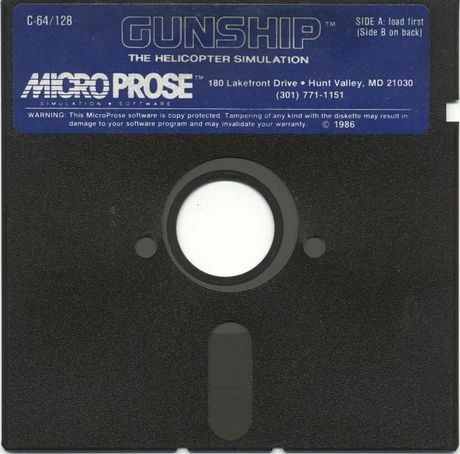 MicroProse raised the bar with Gunship in comparison to other helicopter simulations as e.g. 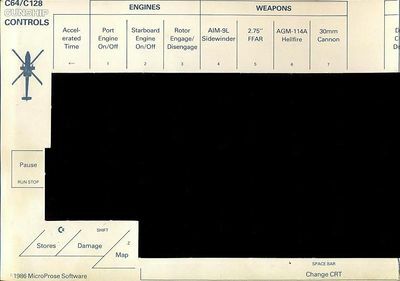 "Super Huey", "Combat Lynx" or "Tomahawk" concerning the areas graphics and playability. Missiles and other projectiles are visualised by sprites, landscapes and enemies by vector graphics, whereby the hills are shown with a filled area, are taken into account to the collision calculation and also block the line of sight of the aiming device. Despite the calculations needed for this, the framerate is still in the upper single digit area and with this not bad for the C64, however, the rate for the queries of the input devices suffers, which results in the joystick controls being a bit notchy. The disk version blares a few strokes of "Ride of the Valkyries" at the end of the animated intro sequence, as the cliche requires it since Apocalypse Now. In other respects, the game is rather silent, the few sound effects during the missions are kept simple but functional. Gunship has numerous functions and complex controls, that uses next to the joystick also many keys on the keyboard. For this an own keyboard template was enclosed to the game. It facilitates the access to the game especially for unexperienced players. Different weapon systems and an aiming device can be used. For firing the missiles the board computer is also helpful. A navigation and radar system facilitate orientation on the place of combat. The headquarters sends messages by radio. When the simulation was released the damage evaluations was highly praised, hostile hits have numerous different effects on the helicopter. Up to eight pilots can save their status and progress on the programme disk. Ranks and medals do not get lost and the competition between different players is possible. The programme also has a highscore list. The programme was only moderately protected against software pirates. Copying the relevant pages from the manual was probably cheap in the 1980s. The copying of the disk version is additionally aggravated by the Rapidlok V6 copy protection/fastloader. Until the actual game - the mission - starts, there are several sections of longer loading times. Well, Mr. Cadet, where do you want to go? To Vietnam, to rough up regular troops? With realistic flight behaviour and the possibility of a crash-landing? Have you not bitten more off than you can chew for the first flight? Your mission: grund support. Eliminate all hostile troops in the vicinity of the landing zone at coordinates 03-08. If you are then still in the mood and have some time, it would be nice if you could eliminate the infantry at 10-05. And bring a donut and a cup of coffee please. That would be all. Check list: Do you know the correct password? Not that our flak gets into the situation of having to shoot you. And remember where your mission targets are, the ammunition is expensive! You have deposited your testament? Okay, go ahead! Thanks to a favourable weather the helicopter can be equipped with numerous weapon systems in this mission. A night mission flight: right at the start a T-72 tank and two BTR-70 armoured personal carriers are eliminted with the help of the Hellfire weapon system. 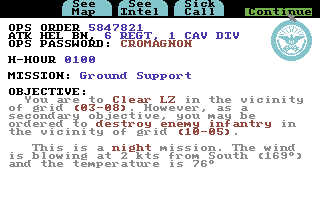 The warning on the CRT screen says that a hostile HIND helicopter has started which certainly will cause some trouble in the later course of the mission. This sheet was enclosed to the game. To be able to land safely on a U.S. base during a mission the corresponding countersign to the shown password needs to be entered - if you make a mistake the fire will be opened at the player and a successful ending of the mission is impossible! An overview of the vehicles that need to be identified at the start is here. Approaching the mission's target: a base of the Warsaw Pact. You can clearly see the hostile defensive projectiles and the noisily passing air defensive missiles. Although a hostile hit eliminates the weapon systems of the portside wing, it is possible to hit the base with a FFAR. They always come down: After a direct hit into the gears, this mission ends with a spectacular crash-landing and a promotion (to the afterworld). Successful pilots can be saved in the Pilot Roster to continue their career later. Restore pressed together with one of the keys for weapons creates an emergency throw of the corresponding weapon, maybe to make the Apache lighter after an engine failure. Pressed together with Runstop the game is aborted. (*) The colour of the target box shows the probability for a hit. The brighter the better. To save ammunition you should only fire the corresponding weapons when the target box is white or at least bright grey. (**) You can also change the target of a Hellfire while it is on the way. But this is not recommended as the accuracy suffers when the Hellfire needs to change its course and a soft target could possibly get into the way against which the missiles is without any effect. 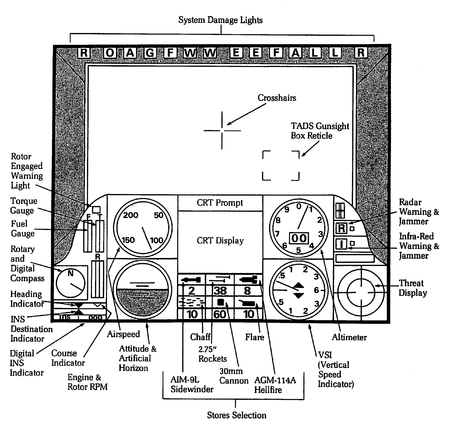 An explanation of the cockpit displays from the manual. 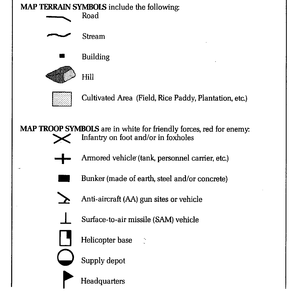 The meanings of the symbols in the map. To lift off, start both engines, couple in the rotor and as soon as this reaches the full revolutions raise the rotor power to the maximum. While you wait for that you can set the marker on the map to the coordinates of your choice. To land, approach an allied base and put down the Apache near the "T" painted on the ground. For a smooth landing the flying speed should not surmount 10 knots and the sinking speed should not surmount 500 feet/minute. After the touchdown switch off both engines. In contrast to the training area, the position of most hostile units in the real conflict areas are at first unknown and are only marked on the map when you attack them with the aiming device or when they aim for you and by this get visible in the threat display. The higher you rise, the more you can locate hostile units in a bigger the distance, but they can also locate you from several kilometers distance and shoot at you. Therefore you should carefully rise to approx. 200 feet only on own territorium and in areas that you have already cleared to get an overview before you dare on unknown territorium. If the threat display shows contact to the enemy quickly reduce height. However, you should not fly too deep in the long run, when flying below 50 feet the aiming device sometimes overlooks enemies even if they are directly in front of the helicopter. Furthermore, the Apache is rather unstable when flying fast at a lower height. If hostile units suddenly appear very closely on the threat display it is better to first avoid them instead of instantly starting a counterattack. The threat display is too unprecise to home on the enemies and while you are curving around in search of the target you will collect many hits. It also does no harm to press the target changing key while you fly towards a target, so that you do not overlook any threats. Beware of hills: Not only can you hit them, the enemy also likes to station units on the "shadowy side". Instead of flying over it and with this becoming a target for all the enemies in the surrounding, you should rather fly around it in a wide berth or carefully levitate sideways along it to maybe be able to instantly shoot at enemies that may be waiting at the foot of the mountain. The Hind helicopters can destroy the AH64 within a short time span if you let them get nearer than 1 km. Therefore always have an eye on the warning display to be able to eliminate Hinds as early as possible. The Sidewinder can also be fired while a different target is in visor, if it can "see" the helicopter (i.e. it is approx. at 12 o'clock position on the threat display and does not hide behind a hill), it will also head for it. If you do not have any Sidewinders left, the FFARs will also work if you aim precisely and the Hind comes directly towards you. If you have no more FFARs and you can also not escape to a base, then only the close combat with the board cannon is left; you will get the fewest hits if you fly as quickly as possible, change the height very often and force the enemy to fly in from the side. Areas with numerous hostile ground troosp are utterly inept for such an encounter. You can make as many technical stops as you like, to refill fuel and ammunition or make repairs at the helicopter. However, this costs time and from a mission length of 20 minutes onwards you will get subtracted points. But this is still better than crashing in no man's land due to lack of fuel. Repairs do not only take especially much time, the enemy will also lead more backup onto the battlefield during this, therefore you should think well whether a repair is necessary or not. E.g. you will need the Chaff Launcher very rarely and you can also do without the avionics in the front and when the mission targets are close to the base you can even get over the leaks in the fuel tanks. In contrast, defects at the engines and rotors are very dangerous and restrict the controllability of the AH64 heavily. Especially brave pilots can also switch off the engines for a short time or decouple the rotor to be able to sink especially quickly in dangerous situations. For this you need to fly at least 150 feet high and you must not forget to readjust the rotor power. The keyboard overlay that was enclosed to the game draped over a C64 Keyboard. The Cracker group Da Laxatives has equipped the game amongst others with trainer functions. This version you can find at CSDb - Release No. 77838. Then continue the game and shoot around without consideration. Boris Schneider: Super! - "I find it a real pity to have only so little space to describe Gunship. Because the programme (I do not dare calling it game) is so complex that I would need several pages only to describe all the single functions of the simulation. Some reader might find it strange that I evaluate an obvious war game with such a high vote. But with Gunship I just have to make an exception. Here things get neither embellished or glorified, nor is any political position taken or is a kind of Vergangenheitsbewältigung made. Furthermore, the programmers attached great importance on the fact that you do not fight against Russian troops, but merely fictitious eneimes, that only act as Russian troops. In other respects some words about the graphics: There is probably no better way to do it on an 8 bit system. However, the 16 bit versions of Gunship are said to be released this summer, which should be even a few notches above this." Gregor Neumann: Super! - "Gunship is the best and most complex helicopter simulation that I have played until now. I am used to a more elegant flying feeling from the game Tomahawk, but you get used to it very quickly that everything does not go as fast but very determindedly. 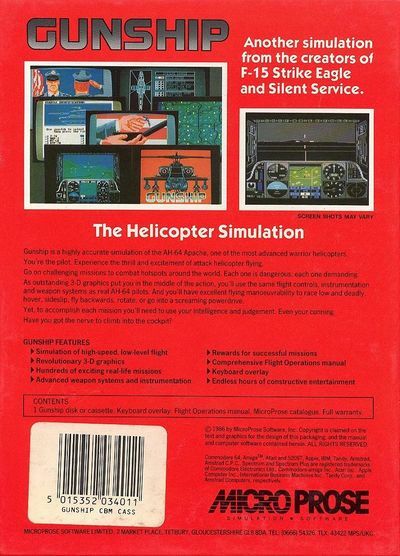 Concerning the playing value of a helicopter simulation one needs to be divided in the opinion, there are really more peaceful games than Gunship. But for me being able to control the machines has a greater role than the killing of people. Despite the military content, everything is abstract enough for my taste to illustrate that everything is just a simulation that must not be confused with reality. Therefore I have personally no reservations to also flying the special missions that are garbage concerning the content but create the biggest challenge concerning the difficulty grade. Therefore the playing value of such a simulation can for me not be outmachted because no flight is like the other and also after even many flying hours each start is still a challenge especially in Gunship." 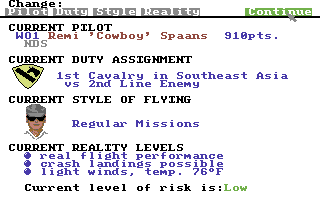 Colt: "The probably most sophisticated flight simulation for the C64. Strategical options in great numbers and sooner or later chaos breaks out and you have your hands full to stay alive in the virtual world. The only weak point is the slightly notchy controls, which can especially turn the adjustment of the marker on the map into a game requiring great patience. All in all it was highly successful and worth to me 9 points." As with almost every relases by Microprose for the C64 the not time critical progamme parts are written in BASIC. 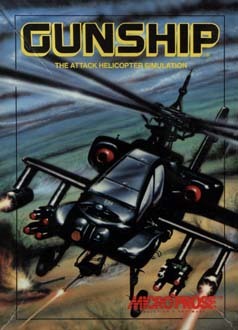 Gunship was originally planned as a more arcade-like simulation of the Bell AH-1 Cobra helicopter with urbane operation areas, possibly inspired by the success of the action movie "Blue Thunder" that had been released a few years before. The release was plannend for November 1985 fitting the Christmas trade and correspondingly they already advertised it heavily in the summer the same year. 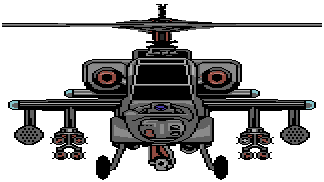 However, the development of a graphics engine that could plausibly display a landscape of a city posed enormous problems and the introduction of the Apache AH-64 in the US-Army at that time and Sid Meiers 3D landscape experiments on the Amiga led to a new design of the game into its final shape. 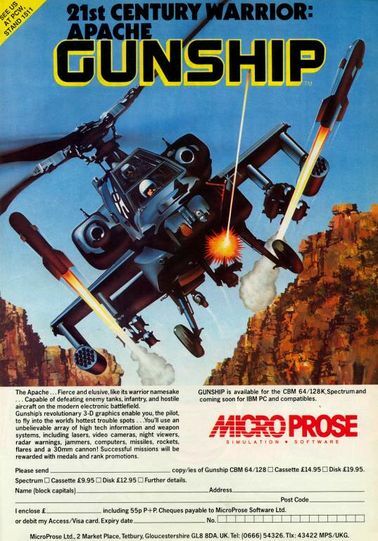 The finalisation on the game delayed by this until the end of 1986, by which Gunship counted for a long time as Vaporware as probably one of the first games ever. 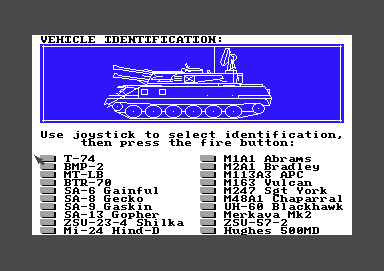 If you switch out the C64 at the wrong time in the game, it can happen that the Pilot Roster cannot be loaded at the next start and is deleted, by which you will lose all your elaborately gained medals and promotions. The problem can be avoided most of the time by switching off the C64 when the game asks for the second disk side (or for the one-sided version when it has loaded the next mission). If you want to play safe, you can also save the Roster data periodically on other disks, e.g. with this programme. 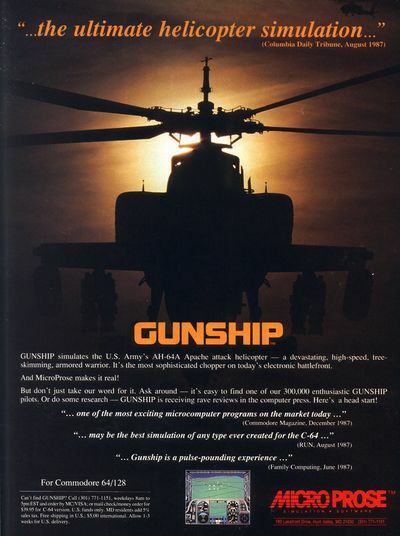 The follower was named Gunship 2000 and was released in 1991 for MS-DOS and in 1993 for the Amiga. The Islands & Ice Expansion Pack was released in 1992 only for the PC. 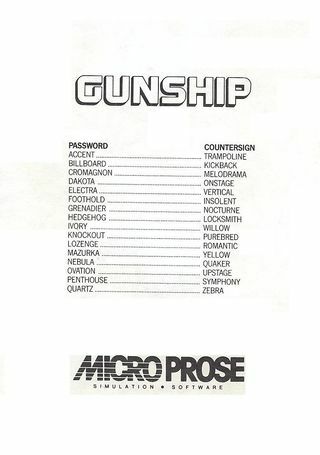 Gunship 2000 was not converted to the Commodore 64. In 1999 the until now last part of the series was released with Gunship!. 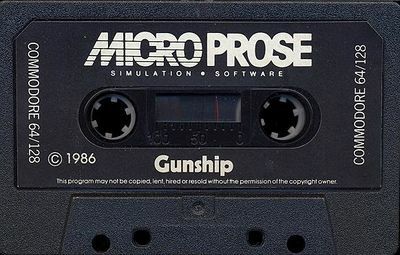 The game Gunship 94 is a horizontal shoot'em up and was created with SEUCK, there is no connection to the MicroProse game. Origins Award 1986: Award for "Best Graphics in a Home Computer Game". Zzap!64 readers voted the game as the best simulation of 1987. Happy Computer let the editors decide about the prizes. 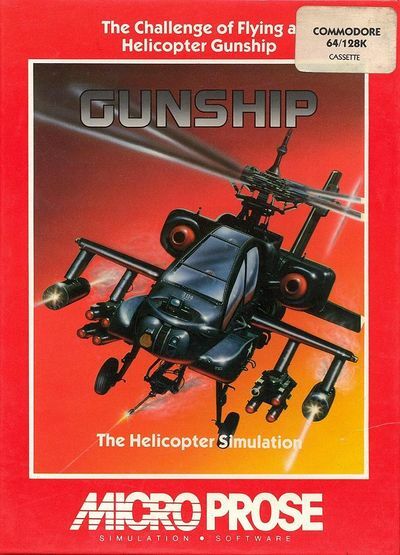 Also here was Gunship awarded as "best simulation 1987". With correct printer settings you can print this template in original size. This page was last modified on 7 March 2019, at 12:29.